Legendary underground horror director Jörg Buttgereit (Nekromantik, Schramm) took a few moments to talk to us about his new short film A Moment of Silence at the Grave of Ed Gein, which will have its U.S. Premiere this Sunday at PhilaMOCA as part of Vivisections! Doors open at 7 and the show starts at 7:30. Tickets are $8. You got your start shooting Super 8 shorts in 1977 and have continued to create them throughout your career. How has your approach changed over the years and what is your preferred format to shoot in? JB: It really depends on the project. It makes no sense shooting a documentary film like Monsterland on film today. You do this digital. But if I do music clips I still like to shoot in Super 8. 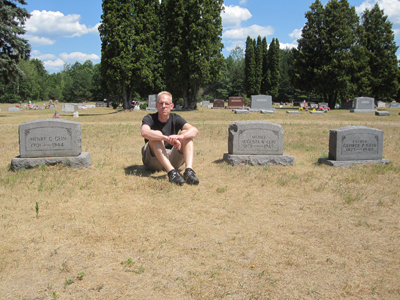 You visited the grave of Ed Gein in 2012. What were the circumstances of the journey and, aside from creating the film, what other reasons (if any) did you have for visiting his grave site? JB: I was invited to a horror convention and was close by. I visited the grave because the case influenced my films like Nekromantik. And I was preparing a stage play on Ed Gein called Kannibale und Liebe for a German theater. While many killers have had their crimes translated to the cinema, Ed Gein seems to have made the greatest impact. What is it about his story that keeps people coming back again and again? JB: I think Ed Gein is the first American Horror-character. Monsters like Frankenstein, Dracula or the Mummy came from the outside. But Gein came from the inside of America. Of all of the films that have been inspired by Ed Gein, which is your personal favorite and why? JB: I love Psycho, TCM and Silence of the Lambs. Every film deals with a diffent aspect of this weird character. How did you get involved with the upcoming anthology film German Angst and what can fans look forward to from your segment and the film as a whole? JB: We like to continue the horror tradition that was formed in the 20th century in Germany. Since WW2 we do not have a horror culture in Germany any more. That’s why I had so many censorship problems with my films in Germany. German Angst will show you 3 different stories located in Berlin.